BMH books author and Grace Theological Seminary graduate, Robert Kellemen Ph.D. (pictured), will be speaking this coming Thursday, February 19, from 9 AM to 12:30 PM at the Winona Lake Grace Brethren Church, 1200 Kings Highway, Winona Lake, Indiana. Anyone interested in learning and growing as a biblical counselor is invited to attend. From 9-9:30, coffee and donuts will be served, and then from 9:30 to 11:30 there will be an open forum. Dr. Kellemen will lead a question-and-answer time on biblical/Christian counseling–anything from general questions about the field, to specific questions about how to help people in various struggles. 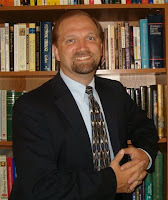 Dr. Kellemen will also share an overview of his books: Soul Physicians, Spiritual Friends, and Beyond the Suffering. Plus he will announce his latest two books to be released by BMH in 2009 and 2010. Dr. Robert W. Kellemen is chairman of the Master of Arts in Christian Counseling and Discipleship Department at Capital Bible Seminary in Lanham, Md. He also works as a consultant for the 50,000-member American Association of Christian Counselors (AACC). He is the Director of the AACC’s Religious Leaders’ Division and also the AACC’s Theology and Pastoral Counseling Director. He earned his B.A. in Pastoral Ministry from Baptist Bible College, his Th.M. in Theology and Biblical Counseling from Grace Theological Seminary, and his Ph.D. in Counselor Education from Kent State University. From 11:30-12:30 the Thursday meeting will continue with a light lunch on site, and the discussion will continue for those able to stay. After 12:30 and continuing until 3:30, Dr. Kellemen will be available for private consultation on counseling cases participants might want to discuss. The entire event is free and open to the public. No reservations are needed.